This article is about the men's team. For the women's team, see Greece women's national football team. 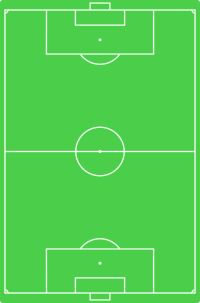 The Greece national football team (Greek: Εθνική Ελλάδος, Ethniki Ellados) represents Greece in association football and is controlled by the Hellenic Football Federation, the governing body for football in Greece. 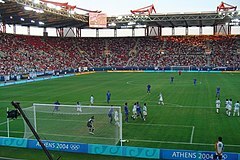 Greece's main home grounds are located in the capital-city Athens at the Olympic Stadium in Maroussi and also in the port of Piraeus at the Karaiskakis Stadium. Greece is one of only ten national teams to have been crowned UEFA European Champions. The UEFA Euro 2004 marked a high point in Greece's football history when they were crowned European champions, in only their second participation in the tournament, against all the odds. The Greeks, dismissed as rank outsiders before the tournament, defeated some of the favourites in the competition including hosts Portugal and defending European champions France, with Greece beating the former in both the opening game of the tournament and again in the final. Their triumph also gave them a qualification for the 2005 FIFA Confederations Cup. The first appearance of a Greek national football team was at the 1906 Intercalated Games in Athens. Later, the Greek team participated in the Inter-Allied Games in Paris, following the end of World War I, and in the 1920 Summer Olympics of Antwerp (recognized as first official by FIFA). A notable figure during these years was Giorgos Kalafatis, player and later manager of the team. During the next decades, the Greek team did not manage to have any success, despite the passion of the Greek people for football. The country's economical and social problems, before and after World War II, did not allow successful preparation of the national team. At its best moment, Greece narrowly missed qualifying for the 1970 FIFA World Cup, despite a good quality team, including some of the greatest-ever Greek players, such as Mimis Domazos, Giorgos Sideris, Giorgos Koudas and Mimis Papaioannou. Greece, under the guidance of Alketas Panagoulias, made its first appearance in a major tournament at the Euro 1980 in Italy, after qualifying top of a group that included the Soviet Union and Hungary, both world football powers. In the final tournament, Greece was drawn into group A with West Germany, the Netherlands, and Czechoslovakia. In their first game, Greece held the Dutch until the only goal of the game was scored with a penalty kick by Kist, in the 65th minute. Three days later Greece played Czechoslovakia in Rome. After holding the Czechoslovakians 1–1 at the end the first half, Greece eventually lost 3–1. In their last game, Greece earned a 0–0 draw against eventual winners West Germany, concluding what was considered a decent overall performance in the team's maiden presence in a final phase of any football competition. The team's success in qualifying for the 1994 FIFA World Cup in the United States, marked the first time they had made it to the FIFA World Cup finals. Greece finished first and undefeated in their qualifying group, surpassing Russia in the final game. In the final tournament Greece were drawn into Group D with Nigeria, Bulgaria, and Argentina. After the successful qualifying campaign, expectations back in Greece were high as no one could imagine the oncoming astounding failure. Most notable reason for this complete failure was the fact that legendary coach Alketas Panagoulias opted to take a squad full of those players – though most of them aging and out of form – that helped the team in the qualifying instead of new emerging talents seeing it as a reward for their unprecedented success. Furthermore, they had the disadvantage of being drawn into a "group of death", with runners-up at the 1990 FIFA World Cup Argentina, later semifinalists Bulgaria, and Nigeria, one of the strongest African teams. It is worth mentioning that all players of the squad, including the three goalkeepers, took part in those three games, something very rare. This tournament was humiliating for the Greek squad. In their first game against Argentina at Foxboro Stadium just outside Boston, they lost 4–0. Four days later Greece suffered another 4–0 blow from Bulgaria at Soldier Field in Chicago, and then, in what would be their final game, they lost to Nigeria 2–0 at Foxboro Stadium again. In the end, Greece were eliminated in the first round by losing all three games, scoring no goals and conceding ten. Greece failed to qualify for the Euro 1996 finishing third in the group behind Russia and Scotland. In their 1998 World Cup qualifying tournament the team finished only one point shy of second-placed Croatia after a 0–0 draw by the eventual Group winners, the Danish. In their Euro 2000 qualifying group, Greece finished again in third place, two points behind second-placed Slovenia in a highly disappointing campaign that saw the team lose at home to Latvia. In the 2002 World Cup qualifying Greece finished a disappointing fourth in their group behind England, Germany and Finland, which led to the sacking of coach Vasilis Daniil, replaced by Otto Rehhagel. Highlights of the campaign included a 5–1 defeat in Finland and the 2–2 draw that followed in England, the first two games of the soon to become legendary German coach at the reins of the Greek national team. Thodoris Zagorakis, captain of the national team and "player of the tournament" in Euro 2004. Greece started the qualification process for the Euro 2004 in poor fashion losing at home to Spain and away to Ukraine, both times with a 2–0 scoreline. Astonishingly, the team went on to win their remaining six games, including a highly decisive 1–0 away win over Spain in their second matchup, securing first place in the group and an appearance in the European Championship finals for the first time in 24 years. Greece were the second-least favorite in the competition to win, with Latvia being the least favorite. Greece were also considered as outsiders and underdogs and were given odds of 150–1 of winning before the tournament. They were drawn in Group A, ending up with Portugal, Spain and Russia, a "group of death"; Portugal, hosts and favourites to win, Spain, former European champions, and Russia, who won the first-ever Euro as the Soviet Union. Very few people expected Greece to proceed to the quarter-finals, let alone win the tournament. In the opening match against hosts Portugal Greece achieved a surprise 2–1 victory, receiving the nickname "pirate ship" (Το Πειρατικό) used by Greek sportscasters in reference to the floating ship used in the tournament's opening ceremony. Greece won with a 25-yard strike by Giorgos Karagounis and a penalty by Angelos Basinas. Four days later, Greece stunned Spain in front of a largely Spanish crowd with a 1–1 draw after being down 1–0 at half time. Greece fell behind from a defensive lapse, which allowed Fernando Morientes to score. However a sublime diagonal pass by playmaker Vasilis Tsiartas allowed Angelos Charisteas to score an equaliser in the second half, giving Greece hope of qualifying. In the final group match Greece fell behind 2–0 to Russia (who were already eliminated) within the first ten minutes of the game but managed to pull one back through Zisis Vryzas and thus progressed to the next round, at the expense of Spain, on goals scored. Dmitri Kirichenko had the chance to eliminate Greece in the final minutes of this match, but his stretched effort squeezed just wide. In the quarter-finals Greece faced off with the undefeated and reigning champions France. At 65 minutes Greece took the lead. Angelos Basinas played a perfect pass to captain Thodoris Zagorakis, who flicked the ball high in the air, past veteran French defender Bixente Lizarazu, and sent a perfect cross to Angelos Charisteas for the header and goal. Greece held on to win despite a late French onslaught, with close efforts by Thierry Henry, thus knocking France out of Euro 2004 and becoming the first team ever to defeat both the hosts and defending champions in the same tournament. Greece reached the semifinals to face the Czech Republic, who were the only team to defeat all of their opponents to that point. The Czech record included a convincing 3–2 win over the Netherlands, a 2–1 win over Germany, and a 3–0 win over Denmark in the quarter-finals. At this stage in the tournament the Czechs were favourites to take the trophy. The game began nervously for Greece, as the Czech Republic applied much pressure. Tomáš Rosický hit the bar in the opening minutes, and Jan Koller had several efforts saved by Antonis Nikopolidis. The Czechs chances were dealt a blow when influential midfielder Pavel Nedvěd left the pitch injured in the first half. After 90 minutes the game ended 0–0, despite the Czechs having most of the game's missed chances. In the final minute of the first half of extra time, a close range silver goal header by Traianos Dellas from a Vasilis Tsiartas corner ended the Czech campaign, putting Greece into the final of Euro 2004 and sending their fans into raptures. 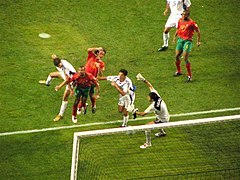 Angelos Charisteas scoring Greece's winning goal in the Euro 2004 final. Greece starting line-up against Portugal at the UEFA Euro 2004 Final. For the first time in history the final was a repeat of the opening match, with Greece and hosts Portugal facing off in a rematch. In the 57th minute Charisteas gave Greece the lead with a header from a corner by Angelos Basinas. Portugal had much of the possession, but the Greek defence was solid and dealt with most attacks. Cristiano Ronaldo had a good chance to equalise in the dying moments, but could not apply a finish. Greece held on to win 1–0, winning the tournament, an achievement considered by many to be one of the greatest football upsets in history, if not the greatest. Greek captain Zagorakis was named the player of the tournament, having led Greece and made the most tackles in the entire tournament. Greece's victory shot them up in the FIFA World Rankings from 35th in June 2004 to 14th in July 2004. This is one of the largest upward moves in a single month in the top echelon of the rankings. The triumph of Greece at Euro 2004 is the biggest sporting achievement in the country's history for a team sport, along with the successes of the Greece national basketball team in the European Championships of 1987, 2005 and 2006 FIBA World Championship and the World Championship title of Greece women's national water polo team in 2011. The team has appeared on stamps and received medals from Konstantinos Stephanopoulos (the President of Greece), Archbishop Christodoulos of Athens, and an ecstatic ovation from the country's population which came out to see the team drive with the trophy from the Athens airport to the Panathenaic Stadium where the Greek political and religious leadership was awaiting them. The Euro 2004 winners were selected as "World Team of the Year" at the 2005 Laureus World Sports Award for Team of the Year. As Euro 2004 winners, Greece qualified for the 2005 FIFA Confederations Cup in Germany. Greece were drawn into Group B along with 2002 World Cup champions Brazil, 2004 Asian champions Japan, and 2003 North America champions Mexico. Greece lost 3–0 to Brazil and 1–0 to Japan and drew 0–0 with Mexico in a tournament that was seen mostly as a time for experimentation as players like Stathis Tavlaridis, Loukas Vyntra, Michalis Sifakis, Giannis Amanatidis and Fanis Gekas either received their first-ever calls or earned their maiden caps in the national squad. After winning the Euro 2004, Greece were considered favourites to top their group, in the 2006 World Cup qualification. The team was drawn into Group 2 along with Ukraine, Turkey, Denmark, Albania, Georgia and Kazakhstan. In their first qualifier, Greece could not handle the game with Albania and lost 2–1. Afterward their matches were followed by draws (home and away respectively) with Turkey and Ukraine, before defeating Kazakhstan 3–1 at home. It was thought that the team was back on course as the 2–1 win over Denmark, with Thodoris Zagorakis scoring his first-ever goal in over 100 caps. This was followed by wins against Georgia and Albania and a respectable away draw with Turkey. However, despite dominating the game, Greece lost at home to Ukraine 1–0 having two goals disallowed. Three months later, Greece barely escaped embarrassment as they scraped to a 2–1 away win against Kazakhstan in the dying seconds. Greece was defeated 1–0 by Denmark in Copenhagen as chances for a qualification through a playoff looked dismal after the 1–0 win of Turkey in Kiev against the already qualified Ukrainian side. In their last game, Greece defeated Georgia, finishing 4th, four points behind first-placed Ukraine and two behind Turkey. Throughout the match, the 30,000 fans in the Karaiskakis Stadium chanted the name of Otto Rehhagel in their utmost support and he said afterwards "Even if 10 years pass, part of my heart will be Greek". There was a dissatisfaction with the selection of the team by Otto Rehhagel throughout qualification campaign from some journalists as they argued that he was sticking to exactly the same Euro 2004 squad even though some players didn't even have a club and was overlooking others most notably Ieroklis Stoltidis of Olympiacos and Akis Zikos of AS Monaco. On 25 May 2006, less than a month before the opening of the 2006 World Cup in Germany, Greece lost 1–0 to Australia in a friendly match in front of 95,103 people at the MCG in Melbourne. Greece vs Spain in Red Bull Arena during UEFA Euro 2008. Greece was the highest-ranked seed in the "pots" for qualification to the UEFA Euro 2008 in Switzerland and Austria and was drawn with Turkey, Norway, Bosnia and Herzegovina, Hungary, Moldova and Malta, being the only group which did not have a team represented at the 2006 World Cup. Greece began their Euro 2008 campaign with victories over Moldova, Norway and Bosnia and Herzegovina. As a result, Greece climbed 18 places in two months to 13th place in the October FIFA World Rankings. On 24 March 2007, Greece lost their fourth game 4–1 against Turkey in Athens. Nevertheless, the team went on to win away to Malta, with the only goal coming in the 66th minute from an Angelos Basinas penalty, beat Hungary and Moldova at home and drew 2–2 away to Norway despite having hit the goalpost three times in this match. 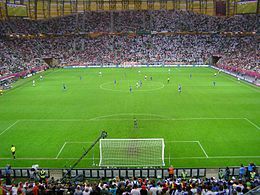 The draw in Oslo was followed by a 3–2 home win against Bosnia-Herzegovina and a 1–0 away win to Turkey, securing its presence to the Euro 2008 finals at their old rival's home ground. In the last two matches, Greece smashed Malta 5–0 in Athens and defeated Hungary with an away 2–1 win, finishing first in their group with a total of 31 points, the most points gained among any group. In the draw for the final tournament, Greece was seeded first as the defending European Champion. In addition to this, Greece climbed to the 11th place in the FIFA World Rankings, thus they were seeded first for the draw of the European qualification zone for the World Cup 2010 for the first time in their history. The draw for the Euro 2008 finals was held on 2 December in Switzerland, Greece were drawn in Group D along with Sweden, Spain, and Russia. In preparation for the tournament, Greece defeated Portugal 2–1 on 26 March 2008, in a repeat of the Euro 2004 opening and final match; as a result, Greece moved up to an all-time high eighth position in the FIFA World Rankings. In the tournament finals, however, the Greek team lost all three games and scored only one goal. Greece underperformed in the opening match against Sweden and lost 2–0. They tried to recover in the match against Russia, but lost 1–0. Having already been eliminated, the Greek team went all out against already qualified Spain, but lost 2–1, becoming the first defending champion not to earn a single point in the next European Championship. Despite the scoring prowess of Europe's top 2010 World Cup qualifying goal-scorer Fanis Gekas—who produced 10 goals in as many games—Greece took second place to Switzerland in Group 2 of UEFA qualification, thus advancing to a home-and-away playoff round, where they faced Ukraine. After a scoreless draw at home in the first match, the second leg in Donetsk saw Greece triumph with a 1–0 win, sending the Greeks to the 2010 FIFA World Cup. At the 2010 World Cup draw in Cape Town, South Africa on 4 December 2009, Greece found itself grouped with two familiar opponents from its first World Cup appearance in 1994. Argentina and Nigeria were yet again drawn into group stage play alongside Greece, this time into Group B with South Korea replacing Greece's third 1994 opponent, Bulgaria. In its World Cup opener, Greece lost 2–0 to South Korea after a dismal performance characterized by excessive long-ball attacks and a lack of offensive creativity. In the second fixture against Nigeria, Greece won 2–1, coming from behind after conceding an early goal. Dimitris Salpingidis scored Greece's first-ever goal in the World Cup finals in the 44th minute of the first half to tie the match at 1–1. Vasilis Torosidis scored the winning goal in the 71st minute, securing the first points and first victory for Greece in tournament history. In the third match against heavily favoured Argentina, Greece needed a combination of results to advance to the next round. As expected, in what would be his final game as Greece's national team head coach, Otto Rehhagel conjured up a very defensive-minded strategy, leaving Georgios Samaras with nearly all offensive responsibilities as the lone striker. The strategy nearly paid off in the second half with the score still locked at 0–0 when Samaras beat the last Argentine defender on a quick long-ball counter-attack but curled a rushed shot just wide of the far post. The Greeks held the Argentines scoreless until the 77th minute but ultimately lost 2–0, finishing third in Group B.
Greece moved from 13th to 12th in the FIFA World Rankings following the tournament. Russia, Croatia and France dropped lower than Greece while Uruguay and Chile jumped ahead of the Greeks. Twenty-four hours removed from Greece's World Cup loss to Argentina, Otto Rehhagel stepped away from his post as Greek national team manager. Eight days later a new era in Greek football was ushered in as the Hellenic Football Federation named former AEK Athens and PAOK boss Fernando Santos the new manager. Under Santos the Greeks immediately went to work on an unprecedented streak of success, setting a senior-club record by going unbeaten in Santos' first seventeen matches as manager. While Greece's proficiency in stifling opposition attacks seemed to wane toward the end of Rehhagel's tenure, the emergence of Santos seemed to galvanize Greek defending once more. Through seven international friendlies and ten Euro 2012 qualifiers, the Greeks kept nine clean sheets and conceded just one goal in each of the remaining eight contests. From start to end of their unbeaten run, Santos' national side moved from #12 to #8 in FIFA's world rankings, equaling the highest mark in history credited by FIFA to Greece. Only one match from their streak featured a team (other than Greece) that appeared at the 2010 World Cup, a 1–0 defeat of Serbia in Belgrade. With its late-game comeback victory over Georgia in October 2011, Greece padded its historic football tournament résumé, most importantly by sealing an automatic berth into UEFA's 2012 European Football Championship tournament. For the second time in team history the national side won its qualifying group for a major football tournament without a single loss incurred, as Greece also went undefeated in 1994 World Cup qualifiers. Adding to its 1980, 2004 and 2008 Euro qualifying campaigns, the Georgia triumph marked the fifth time overall that Greece has won its qualification group for a major tournament. Although their tendency to produce positive results remained steady throughout qualifying, so too did the Greeks' proclivity to start games slowly and concede early goals. This habit would plague the Greeks through qualifying and eventually tarnish their Euro 2012 performances. Over two qualifying contests, Greece trailed Georgia on the scoreboard for 130 of 180 minutes and still managed to grab four of six possible points in the standings by way of three late strikes. Goals scored in the dying minutes of games, often coming from defenders, became somewhat of a Greek signature on Group F's table. In fact Greece was able to take and keep a first-half lead just once in ten games, the 3–1 home defeat of Malta which was ranked 50th of 53 teams in Europe. In Malta, a last-second tie-breaking strike from defender Vasilis Torosidis pocketed a crucial extra two points in the standings for Greece, the same number of points it held over Croatia at the end of qualifying. Despite allowing weaker teams in the group to bring the game to them, the Greeks admirably held powerful Croatia scoreless through two meetings and deservedly won Group F four days after a decisive 2–0 home win versus the second-place Croats. Fanis Gekas, who retired from national team service in 2010 after Fernando Santos' third game as manager, came out of retirement in time to contribute a goal to the result. Gekas was eventually included in Santos's 23-man Euro 2012 roster, leaving out Euro 2004 hero Angelos Charisteas who scored the group-clinching goal in the aforementioned Greek qualifying victory in Georgia. 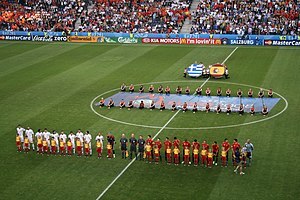 Greek players singing the Greek national anthem in Euro 2012 opening match against the hosts Poland (1–1). "Shades of 2004" was a commonly perceived theme regarding the buildup to Euro 2012 for the Greeks and their progression through the tournament. As in 2004 Greece was drawn into the same group as the host nation, Poland on this occasion, and also had the pressure of playing in the tournament's opening match. Two familiar foes from its 2004 championship run, Russia and Czech Republic, joined Greece and Poland in Group A on 2 December 2011 at the tournament's final draw in Kiev. Upon drawing the lowest-ranked teams from Pots 1 and 2 as well as the second-lowest from Pot 4, Greece's prospects of passing the group stage at Euro 2012 were given a boost. Ideas of steering "To Piratiko" to a dream start in host-nation territory as Greece did in Portugal eight years before, rapidly turned sour during the opening match's first half. From the outset the Greeks appeared uncomfortable holding the ball for long spells and seemed content to allow hosts Poland to push numbers forward with the ball, hoping to score through counter-attacks. However, Poland made the most of its early possession, as top scorer Robert Lewandowski converted a header from a goal line cross past a scurrying Kostas Chalkias. Hope and momentum continued to tip in favor of Poland when Sokratis Papastathopoulos received his second yellow card of the game in just the 44th minute from Spanish referee Carlos Velasco Carballo. The Greeks, however, began to boss the game after halftime while playing down a man. Dimitris Salpingidis made the greatest impact on the game for Greece as a second-half substitute, making brilliant penetrating runs behind the Polish defense, eventually bringing the game level 1–1 on a mistake by Poland keeper Wojciech Szczęsny. Salpingidis was then responsible for levelling up the numbers for the Greeks when Szczęsny made a red-card foul on Salpingidis' breakaway attempt on goal in the 68th minute. But Greek captain Giorgos Karagounis' subsequent penalty kick was turned away by substitute keeper Przemysław Tytoń. A second goal by Salpingidis was disallowed as he was assisted by an offside Kostas Fortounis, denying Greece's best opportunity to take three points from what ended as an improbable 1–1 draw. The Czech Republic exploited Greece's weakness at the left-defender position early in the second group stage match, notching two goals in the first six minutes. Just as Poland had, the Czechs repeatedly penetrated the Greek back line behind left-side defender José Cholevas, scoring on a through-ball and a cross from Cholevas' side. Petr Čech's gaffe on a Georgios Samaras cross in the second half turned into a gift goal for Fanis Gekas. The Czechs then eased off on their early pressure, opting to sit back and guard their lead for much of the second half, but Gekas' goal was too little too late. Greece lost the match 2–1, placing them at the foot of Group A in need of a victory over the attack-minded Russians to advance to the knockout rounds. After thrashing the Czech Republic 4–1 and displaying more offensive potency in a 1–1 draw with Poland, the Russians were favored to earn the one point they needed to advance against the Greeks, especially since defeating the team in both of the previous two European Championships. However, Greece delivered a trademark 1–0 defensive victory and advanced to the Euro 2012 quarterfinals. The Greeks scored when Russian defender Sergei Ignashevich errantly headed a Greece throw-in behind the Russian defense for Giorgos Karagounis to pounce on. Greece's captain sprinted in on goal and struck the ball at the back post under keeper Vyacheslav Malafeev in first-half stoppage time to send the Russians reeling into the locker rooms. Ignashevich appeared to have conceded an additional golden scoring opportunity for Greece upon tripping Karagounis in the Russian penalty area early in the second half, but referee Jonas Eriksson instead booked Karagounis for what he believed to be simulation. This being Karagounis' second yellow card of the tournament, Greece was to be without its suspended captain in the next round. With that victory, Greece qualified to the quarterfinals for a second time after their successful Euro 2004 campaign. Greece played against Germany for a place in the semi-finals of Euro 2012 but they were eliminated after a 4–2 loss in the quarter-final match. In the quarter-finals, Greece met with a Germany side that won all three of its group matches against Portugal, Denmark and the Netherlands. Greece applied very little pressure in the midfield in the opening period, slowing the tempo of the game and affording the Germans the majority of possession. Young Sotiris Ninis switched off momentarily in defence, allowing German captain Philipp Lahm to cut infield and open the scoring with a long-distance strike. Yet the Greeks remained calm as in Georgios Samaras they carried a constant threat. On the counter-attack, they pulled level early in the second half; regaining possession in their defensive third, Giorgos Fotakis found Dimitris Salpingidis streaking 40 yards deep into German territory. Salpingidis delivered a ball five yards in front of goalkeeper Manuel Neuer, which Samaras was able to meet and power underneath Neuer for the equalizer. Twenty minutes later, however, the Germans led 4–1. Greece scored an 89th-minute penalty kick by Salpingidis, but the match ended 4–2 to the Germans, ending Greece's Euro 2012 campaign. To reach the 2014 World Cup in Brazil, Greece had to contend with a team on the rise in Bosnia and Herzegovina and a dangerous Slovakian side seemingly in decline since its memorable 2010 World Cup qualifying and finals performances. Latvia, a familiar qualification foe for Greece in its previous two major tournaments (2010 World Cup, Euro 2012), joined the fray as well. Ahead of those aforesaid tournaments, Bosnia twice narrowly missed out on its first major international tournament appearance due to consecutive playoff defeats at the hands of Portugal. No playoff would be necessary for Bosnia in 2013, as it won its qualifying group over Greece on goal difference. The decisive match was in Bosnia on 22 March, when Greece succumbed to three set-piece goals (two free-kick headers and one penalty miss rebound) in a 3–1 defeat. Greece's defense proved rigid throughout qualifying, conceding zero goals in open play. Four goals were allowed by the Greeks in ten games, the first of which was a penalty by Latvia, and yet four goals were too many for a relatively unproductive Greek attack to overcome. Though Greece was shut out just once, the team only managed to score 12 goals, an output Bosnia reached in its second game. Following group play Romania, which claimed second place over Hungary and Turkey in a group dominated by the Dutch, awaited Greece in a two-legged playoff. The last time the two sides met in late 2011, Romania came into Greece and dealt Fernando Santos his first defeat as Greece manager in his 18th game at the helm. The Greeks reversed the prior 3–1 result in their favour this time, scoring each goal through skillful one-touch passing and finishing. Kostas Mitroglou accounted for three of Greece's four goals in a 4–2 aggregate playoff victory, though none were actual game-winners. Dimitris Salpingidis notched the game winner in Piraeus, while the second leg finished 1–1 in Bucharest. Arena das Dunas before the Japan vs Greece match. Aracaju was chosen as the team's base camp for the tournament in Brazil. Greece was drawn into Group C with Colombia, Côte d'Ivoire and Japan and ultimately created for itself an extraordinarily similar tournament experience as it did two years prior at Euro 2012. The Greeks were put in an early 1–0 hole in their first game against a Colombia team whose exuberant fans generated a hostile away environment. Following its historical penchant, Greece thrived playing from behind as the underdog. Panagiotis Kone narrowly missed equalizing just one minute after Colombia's fifth-minute goal. Trailing 2–0 in the 63rd minute, Fanis Gekas' header off a cross six yards from an open goal caromed off the crossbar for Greece's best chance of the match. The Colombians proved to be the more clinical finishers, prevailing over the Europeans 3–0 despite an even number of goal shots for both teams and a slight possession advantage in Greece's favor. To stave off the threat of elimination, the Greeks needed to earn at least a point in their second match with Japan, who sat alongside them at the bottom of Group C. The task grew more difficult once two errant slide tackles by captain Kostas Katsouranis each drew yellow cards and reduced Greece to ten men in the 38th minute. Eight Greek players on the pitch had endured the same scenario against Poland in 2012 and once again their resolve did not break. Japan controlled much of possession in a 0–0 draw and remained tied with Greece on points due to poor finishing from close range. The draw made it necessary for Greece to defeat Ivory Coast in its final group match in order to reach the round of 16 for the first time in its history. Unlike its mirror-scenario final group match against Russia in Euro 2012, the Greeks came out as the aggressors from the outset against Ivory Coast. An early injury to center midfielder Panagiotis Kone brought on young Olympiacos' midfielder Andreas Samaris, who would score his first international goal after intercepting a faulty back-pass by an Ivorian defender. Also unlike its 2012 match with Russia, capitalizing on a first half opponent miscue would not be enough to carry Greece to a needed victory. Swansea City striker Wilfried Bony equalized for Ivory Coast in the 73rd minute. The Ivorians promptly adopted Greece's defensive strategy but could not hold out until the game's end. In the first minute of stoppage time, Ivory Coast striker Giovanni Sio obstructed a Samaras shot by clipping him from behind in the Ivorian penalty area, resulting in a Greek penalty kick which Samaras converted with 30 seconds remaining in the game, to wild celebrations in Greece. As Group C runners-up Greece was paired in the round of 16 with Group D shock winner Costa Rica, who won its first-ever World Cup group stage over former world champions Uruguay, Italy and England. Trailing 1–0 but dominating possession due in part to a second yellow card to Costa Rican Óscar Duarte, the Greeks forced extra time through a Sokratis Papastathopoulos equalizer ten seconds into stoppage time. This would prove to be the only goal Costa Rica goalkeeper Keylor Navas would concede in open play throughout the tournament. Navas stayed strong to turn away several significant opportunities for the Greeks throughout the 30 minutes of extra time, including a Fanis Gekas' penalty in the game's concluding penalty shootout. Costa Rica claimed its first World Cup knockout stage victory and denied Greece its first by defeating the Greeks 5–3 on penalties. The team appointed Claudio Ranieri as head coach in July 2014. He was sacked in November of the same year after a shocking home defeat to the Faroe Islands. Sergio Markarián was appointed in his place, but he too has come under fire, especially after a second loss at the hand of the Faroe Islands and the team's terrible performances in the remaining UEFA Euro 2016 qualifying. The team's form after September 2014 proved to be abysmal, with no wins in over a year, losing to Romania, the Faroe Islands (twice), Finland, Northern Ireland and even Luxembourg in a friendly match over that period. Greece finished in bottom place in their Euro Qualifying group, earning just one victory against Hungary in the final round, and failing to qualify for the tournament. Greece, along with the Netherlands and Bosnia and Herzegovina were the only nations from Pot 1 not to qualify for the finals. Those three had taken part in the 2014 FIFA World Cup. Incidentally, the three teams would also fail to qualify for the World Cup in 2018. In attempting to qualify for the 2018 FIFA World Cup, Greece would suffer a second successive failure to reach a major tournament. They finished second in Group H of the European qualifying stages, nine points behind runaway leaders Belgium and only two points clear of third placed Bosnia and Herzegovina. Greece began their qualification campaign well with three straight wins against Gibraltar, Cyprus and Estonia, only conceding one goal in the process, and they remained unbeaten for seven matches after drawing their next four games; two of which ended 1–1 in succession against Bosnia and Belgium, and the other two ended 0–0 in the return fixtures against Bosnia and Estonia. Greece then lost 2–1 to group leaders Belgium, but managed to beat Cyprus and Gibraltar to ensure second place in the group, and qualification for the play-off round. Greece were subsequently drawn against Croatia in the play-off round, where they were knocked out over two legs; a 4–1 away defeat set the tone for Greece's campaign, and in the second leg they drew a blank in a 0–0 stalemate against the Croats to signify the end of their World Cup hopes. Kostas Mitroglou finished as Greece's top scorer throughout their campaign, scoring six goals. The Karaiskakis Stadium in Piraeus, the home ground of Greece from 2004 until 2018. Traditionally, Greece have spent most of their history playing their home matches in different stadiums primarily in Athens, but also in a number of other cities around the country. The home ground of the national team was the Karaiskakis Stadium in Piraeus, since its reconstruction in 2004 until 2017. Since their first international game in 1929 and for the next 33 years Greece constantly used as home ground the Apostolos Nikolaidis Stadium. Their first home match away from it was played at the Nikos Goumas Stadium in 1962, while the Karaiskakis Stadium was used for a first time in 1964, when it was renovated. In 1966, the Kaftanzoglio Stadium in Thessaloniki became the first stadium outside of Athens to be used. Since then all these stadiums were alternately used until the early 1980s, while some other stadiums were inaugurated by the national team such as the Thessaloniki's Toumba Stadium and Harilaou Stadium in 1975 and 1977 respectively, along with Greece's first visits in 1976 to grounds outside of the two major cities, such as the Panachaiki Stadium in Patras and the Kavala Stadium in Kavala. In 1982, the Georgios Kamaras Stadium was added to the list of home grounds for the national team, the first in Athens out of the three major stadiums. On 1 December 1982, the newly built Athens Olympic Stadium, to date the largest stadium in the country, housed the national team for a first time and served as its primary home ground for the rest of the 1980s and the 1990s. Meanwhile, a large number of matches was held in various stadiums including old choices and some new in provincial cities all over the country, something that did not change neither in the early 2000s, when the Athens Olympic Stadium was almost abandoned. Since 2004 and the use mainly of the Karaiskakis Stadium, very few of Greece's matches have occasionally been played in other stadiums as well. They returned to Athens and OAKA in 2018 for a friendly against Switzerland and announced they will play their home matches for the new UEFA Nations League there, as well, after 13 years in Piraeus. For the UEFA Euro 2020 qualifiers, they will split time between OAKA in Athens, and the Pankritio Stadium in Heraklion on the island of Crete. Wikimedia Commons has media related to Greece national football team kits. Greece's traditional colours are blue and white, originating from the colours of the Greek flag. Although blue was used for home kit since the team's inception, since their UEFA Euro 2004 triumph their home kit has changed to white. In recent decades Greece wear either a set of white jerseys, shorts and socks, or an all-blue combination. Formerly, a combination of blue jerseys and white shorts and vice versa has also been used. Meanwhile, Greece's kit has occasionally featured stripes, crosses or other designs, as well as various values of blue. On 10 April 2013, it was announced the partnership between the Hellenic Football Federation and American manufacturer Nike, which is Greece's current official supplier, with their first kit debuting on 7 June 2013 in the away match to Lithuania. On 4 March 2014, Greece unveiled their latest kit also worn at the 2014 FIFA World Cup. Before that briefly the Greece's former suppliers were Adidas (2003–2013), Lotto (1998–2001), Le Coq Sportif (2001–2003), Diadora (1992–1998), Puma (until 1990) and ASICS (Euro 1980). As of 7 June 2013, Nike took over the sponsorship rights of the Greek national football team. The crest (εθνόσημο means "national sign"), which is used in the kit, is the official emblem of the national team. Traditionally, Greece is referred to by the media and the Greeks in general simply as Ethniki (Εθνική) in Greek, which literally means 'National'. The team is often called Galanolefki (Sky blue-white) due to the use of the colours of the Greek flag as kit colours. Both nicknames are used for the country's national teams in other sports as well. During the opening ceremony at the UEFA Euro 2004, which took place right before the inaugural game of the tournament between Greece and hosts Portugal, a replica of a 16th-century ship was used referring to the expeditions of the Portuguese explorers of that time. Greek radio sports journalist Georgios Helakis, while broadcasting the opening match, commented that "since the Portuguese team appeared in such a ship, it's time for us to become pirates and steal the victory". 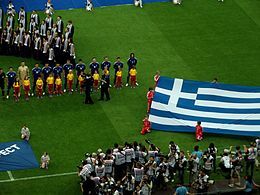 Eventually, Greece beat the hosts and the team was described as Piratiko, meaning the 'Pirate ship', which emerged as the new nickname of the team repeated at every win during the tournament. Especially after the Greek win in the final to Portugal, the new nickname was established to commemorate the coronation of Greece as European champions. Greeks celebrating the victory in the 2004 European Championship. For all past and present players who have appeared for the national team, see List of Greece international footballers. The following players were called up to the Greece squad for the upcoming UEFA Euro 2020 qualifying fixtures against Liechtenstein and Bosnia and Herzegovina, on 23 and 26 March 2019 respectively. Caps and goals correct as of: 26 March 2019, after the match against Bosnia and Herzegovina. The following players have also been called up to the Greece squad within the last twelve months. Greece's iconic midfielder and former captain Giorgos Karagounis is the most capped player in the history of the national team with 139 caps. Nikos Anastopoulos, top goalscorer of the national team. Angelos Charisteas, scorer of Greece's winning goal in Euro 2004 Final and second all-time scorer of Greece with 25 goals. The following table lists all assigned football managers for the national team and their record since Greece's first international game in April 1929. Legendary manager Otto Rehhagel, under whose guidance Greece were crowned European champions in 2004. Alketas Panagoulias, with whom Greece first appeared at the European Championship (1980) and the World Cup (1994). Santos has the national record of 17 unbeaten games. [*] Greece sanctioned for fielding ineligible player (Apostolos Giannou) in the international friendly match played between Turkey and Greece on 17 November 2015. The match is declared to be lost by forfeit and awarded 3–0 in favor of Turkey. These are Greece's results in the three major competitions that they have participated in. The results in the main tournaments have been listed directly in the total column. Greece's history in the FIFA World Rankings. The table shows the position that Greece held in December of each year (and the current position as of 2013), as well as the highest and lowest positions annually. Greece's qualifying matches and friendlies are currently televised by Cosmote Sport and Open TV, a trademark of Digea. ^ "Greece Men's Ranking — Details and Ranking History". FIFA. Retrieved 4 November 2017. ^ "Greece is in the Euro, for the first time, 1980" (in Greek). sansimera.gr. ^ "Machlas sent Greece to its first World Cup!" (in Greek). gazzetta.gr. ^ "The misconduct that "dismantled the National Team"" (in Greek). sport-retro.gr. ^ "Greece defy the odds at Euro 2004". news.bbc.co.uk. Retrieved 20 December 2004. ^ "Greece shock hosts in Euro opener". cnn.com. Retrieved 12 June 2004. ^ "Greece 1-1 Spain, Euro 2004". bbc.co.uk. Retrieved 16 June 2004. ^ "Greece - France 1-0 at Euro 2004" (in Greek). gazzetta.gr. ^ "1/7/2004: Goal and go for the final!" (in Greek). sport24.gr. ^ "Dellas fires the silver bullet". theguardian.com. Retrieved 1 July 2004. ^ "Greece is in the final of EURO 2004!" (in Greek). gazzetta.gr. ^ "The goal of Charisteas in the Euro 2004 final that sent Greece to the seventh heap" (in Greek). enikos.gr. ^ "Revisiting Greece in Euro 2004: A True Underdog Story". eifsoccer.com. ^ "Greatest Euro shock ever?". bbc.co.uk. Retrieved 5 July 2004. ^ "Greece shock football world with Euro win". telegraph.co.uk. Retrieved 5 July 2004. ^ "Greece's Zagorakis named Euro MVP". cbc.ca. Retrieved 5 July 2004. ^ "Greece welcomes back squad". bbc.co.uk. Retrieved 5 July 2004. ^ "Greeks get heroes' welcome after Euro stunner". kitsapsun.com. Retrieved 6 July 2004. ^ "The Kallimarmaro was thrown, thousands of people deposited the heroes of Rehhagel" (in Greek). in.gr. Retrieved 5 July 2004. ^ "Euro 2004, the Greek festivals" (in Greek). travelphoto.gr. Retrieved 5 July 2004. ^ "Greece Men's Football Team, Laureus Award, 2005". laureus.com. ^ "Turkey 0 vs. 1 Greece - Football Match Stats". espn.co.uk. Retrieved 17 October 2007. ^ "Greece win in Ukraine to qualify for World Cup". telegraph.co.uk. Retrieved 18 November 2009. ^ "World Cup 2010: With Argentina, Nigeria and South Korea, the national team was drawn" (in Greek). protothema.gr. Retrieved 4 December 2009. ^ "Greece get first World Cup win". aljazeera.com. Retrieved 17 June 2010. ^ "The "maiden" victory of the National team in the World Cup" (in Greek). gazzetta.gr. ^ "World Cup 2010: Otto Rehhagel quits as Greece coach". BBC Sport. 24 June 2010. 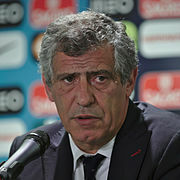 ^ "World Cup 2012 (sic): Fernando Santos named new Greece coach". BBC Sport. 1 July 2010. ^ "Euro 2012: Greece v Russia - as it happened". theguardian.com. Retrieved 16 June 2012. ^ "Greece booked their place at the 2014 World Cup". bbc.com. Retrieved 19 November 2013. ^ "Team Base Camps for Brazil 2014 announced". FIFA. 31 January 2014. Retrieved 28 May 2014. ^ "Slideshow". GE Sergipe. Retrieved 7 June 2014. ^ Astoni, Marco Antônio (4 June 2014). "Gregos de Belo Horizonte preparam festa para partida contra a Colômbia" (in Portuguese). GE Sergipe. Retrieved 7 June 2014. ^ "Greece v Colombia". ESPN.com. 14 June 2014. Retrieved 1 August 2014. ^ "Greece vs. Ivory Coast, 2014 World Cup: Final score 2-1, Greece advances on a stoppage time penalty". sbnation.com. Retrieved 24 June 2014. ^ "Claudio Ranieri sacked as manager of Greece following shock defeat to Faroe Islands in Euro 2016 qualifier". dailymail.co.uk. Retrieved 15 November 2014. ^ "Greece 2018 Squad Info". UEFA. Retrieved 12 December 2017. ^ "Termination of Karaiskakis Stadium for the Greece national football team" (in Greek). sport24.gr. Retrieved 20 November 2017. ^ "In Olympic Stadium the matches of Greece national team for the Nations League" (in Greek). sport24.gr. Retrieved 13 July 2018. ^ "Nike and Hellenic Football Federation announce partnership" (in English and Greek). Nike. 10 April 2013. Retrieved 3 July 2014. ^ "Greece unveils 2014 national team kit with Nike". Nike. 4 March 2014. Retrieved 3 July 2014. ^ "The agreement with NIKE was announced" (in Greek). sport24.gr. Retrieved 10 April 2013. ^ "Η φανέλα με το εθνόσημο" (in Greek). sport24.gr. ^ "Greece national football team Official Facebook page". facebook.com. ^ "Rankings". Unofficial Football World Championships. Retrieved 28 June 2014. ^ a b "Greece sanctioned for fielding ineligible player in friendly". FIFA.com. 27 May 2016. Retrieved 28 May 2016. ^ "FIFA-ranking yearly averages for Greece". Fifa.com. Retrieved 19 November 2018. Αρβανίτης, Στάθης (2004). 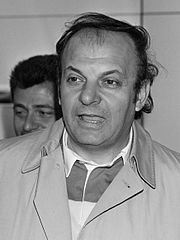 Εθνική Ελλάδος Ποδοσφαίρου 1929-2004 (in Greek). Εκδόσεις Καστανιώτης. ISBN 960-03-3778-0. Μαμουζέλος, Γιάννης Ν. & Νταβέλος, Θοδωρής (2007). 100 χρόνια Εθνική Ελλάδας (in Greek). Αθήνα, Ελλάδα: Εκδόσεις Άγκυρα. ISBN 978-960-42-2497-5. Φασούλας, Χρήστος & Κοντολέων, Δομήνικος (2008). Εθνική Ελλάδος γεια σου! (in Greek). Εκδόσεις Παπαδόπουλος. ISBN 978-960-41-2819-8. Σαμπράκος, Βασίλης (2018). Εξηγώντας το Θαύμα (in Greek). Εκδόσεις Τόπος. ISBN 978-960-499-273-7. Wikimedia Commons has media related to Greece national football team.